Here’s a nice, hearty side dish that combines a lot of different grains for great taste, lots of fiber and an interesting texture. Put half the margarine and olive oil in a medium skillet and saute the onions over medium-high heat until wilted, about 5 minutes. Add the garlic and mushrooms and saute 5 minutes longer, tossing, until the mushrooms begin to brown. Scrape the mixture into a small casserole with a lid. Melt the remaining margarine and the oil in the skillet and add the grains. Saute until the grains begin to brown, about 5 minutes. Pour in the stock and bring to a boil. Pour the stock and grains into the casserole and mix. Cover and bake for 45 minutes. Check after 30 minutes to make sure the mixture is not drying out. If it is, add a little more stock or water. Let the casserole sit out of the oven, covered, about 5 minutes before serving. I used to have a good way to make brisket. I would slice a large onion thin, put a layer under and over the brisket in a roasting pan, add lots of garlic and a little wine, cover and cook for several hours. Then I would cool the brisket before slicing, add sliced mushrooms, and reheat in the gravy. This is still a good way to make brisket — but I have a new favorite that comes from Irma Zigas, the woman my uncle Art married a few years after my Aunt Connie died at the too-young age of 36. Here’s a link to a wonderful video my cousin made about cooking brisket with Grandma Irma. (Part of a wonderful YouTube series called Cooking With Grandma.) It’s not quite as easy as the other method, but it’s easy enough and it’s absolutely yummy. I always get rave reviews when I serve it. Spray a heavy skillet with non-stick spray or put 1 Tbs. oil in the skillet and heat on a medium-high flame. Season the brisket with salt (not needed if using kosher meat), pepper, garlic powder and other spices to your taste, or a blend like Mrs. Dash. Cook the onion until soft and just starting to brown, and scrape them over the top of the meat. Add the tomato paste, cranberry sauce, onion soup mix and water. Bring up the edges of the foil and seal, then repeat with a second piece of foil. Put the foil package in a roasting pan and bake on the center rack of the oven for at least two hours – more for a larger piece of meat. As with the “classic” brisket recipe, the brisket will be even better if made ahead of time, sliced when cool, and reheated. By cooling it first you can also remove much of the fat, which will solidify on the top so you can pick it off. 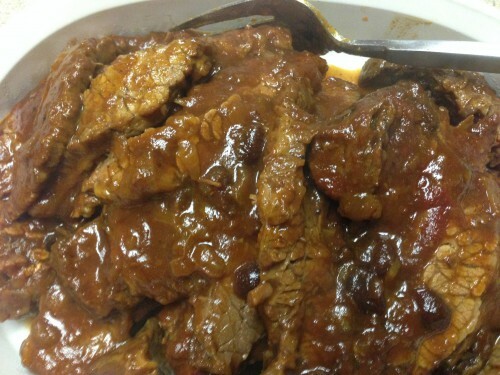 The number of servings depends on the size of the brisket: figure about 3 people per pound of meat. 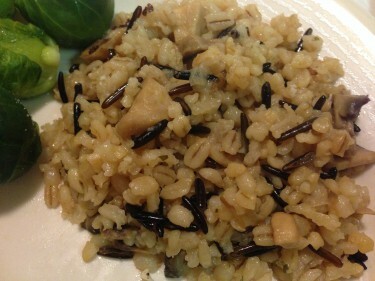 Here’s another nice recipe from the folks at MediterrAsian blog, which I modified just slightly. It’s perfect for this time of year! 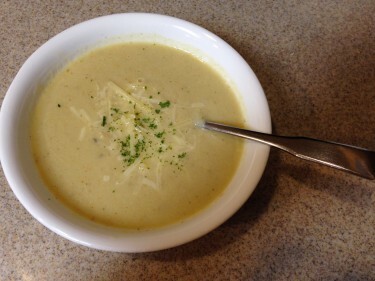 The first time I made this soup, I didn’t even add the Parmesan cheese to serve and it was delicious. Roasting the cauliflower and potato first makes a big difference! I also didn’t have fresh parsley so I used dried — just sprinkled a little on top for color. I didn’t add the final tablespoon of olive oil at the end, but I kept it in the recipe. Preheat the oven to 500 degrees. Place the cauliflower and potato in a baking dish, toss with 2 Tbs. of the olive oil and roast for 15 minutes, stirring once or twice. During the final 5 minutes of the roasting, heat 1 Tbs. of oil in a large pot over medium-low heat and cook the garlic and rosemary for 2 minutes. Add the salt, pepper and stock to the pot and bring to a boil. Add the roast cauliflower and potato and simmer for 2 minutes. Transfer the soup to a blender and process until smooth, or use an immersion blender to blend in the pot. Return the soup to the pot to reheat (or put the pot back on the flame) and stir in the reserved tablespoon of olive oil. Serve topped with a small amount of grated Parmesan cheese, if desired, and a sprinkle of fresh parsley.